Relax on the large patio viewing nature from the lush greenbelt lot. This home has been well maintained by only one owner; is four-sided brick with a large living area with high ceilings and a stunning brick fireplace. 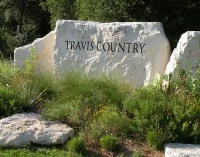 Located in the desirable community of Travis Country with lots of hiking trails including access to the Barton Creek greenbelt trails. There are also a wonderful community garden plus two amenity areas with several community pools, playgrounds, lighted tennis and sports courts.